With the 150th anniversary of Confederation approaching, it is an appropriate time to review the processes and historical contexts that framed the formation of Canada in 1867. The Canada that took shape on July 1, 1867 looked very different from the Canada that we know today. Comprising only southern Ontario and southern Quebec and the provinces of New Brunswick and Nova Scotia, this new dominion accounted for less than 10 percent of the current land mass of the country. But as the essays in series show, many politicians believed fervently in the expansion of the country. They may have embraced too readily a northern version of the “manifest destiny,” however, when they assumed that the creation of a northern country from sea to sea to sea was preordained in the 1860s. Considerable opposition to the constitutional arrangement of 1867 (enshrined in the British North America Act, passed by the British Parliament in 1866) existed: at the conclusion of the debates in the Canadian legislature that this collection of essays considers, politicians voted 91 to 33 in favour of Confederation in 1865. The other British colonies negotiated their entry later (British Columbia in 1871, Prince Edward Island in 1873, and Newfoundland and Labrador eventually in 1949), while title to other large tracts (the western prairies and the Arctic) was transferred with no consultation of the inhabitants. Some of the Métis inhabitants in the Red River region of current-day Manitoba objected to the process, and under the leadership of Louis Riel they staged a resistance that led to the entry of a small portion of southern Manitoba into Canada in 1870. Beyond its geographical boundaries, Canada differed in many other ways from the country in 2016: it was less ethnically diverse, even though the politicians dedicated substantial efforts to bridge the chasm that was perceived to exist in the Western world at the time between Protestants and Catholics, and between English and French. The country was largely agrarian. Few Canadians lived in cities then, while the vast majority do so today. Women had a constrained political role, labour interests had little effective voice, and Indigenous peoples were defined outside of the polity, all with consequences that still require substantive attention today. Concepts and practices of democracy differed as well: to take one example from the 1867 general election, only slightly more than 5,000 voters participated in the election that returned Thomas D’Arcy McGee in the constituency of Montreal West in Canada’s largest city, and the men would have voted in public for their candidate in conditions that we would fail to recognize today as democratic. In contrast, in the 2015 election, the smallest constituency in population was Nunavut, with over 18,000 voters. As one part of York University’s desire to recognize the 150th anniversary of Confederation, we convened a group of scholars to examine the same published source, the debates in the legislature of the United Canadas in 1865, and explore a series of important issues that arise from reading that document. As a result, the debates serve as a prism for examining some of the suppositions and the differences of opinion between the politicians. 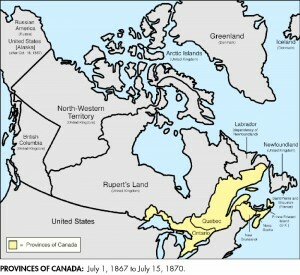 Although the idea of confederating the British North American lands had been raised in different guises for many years, historians often focus on two key meetings, Charlottetown in September 1864, where delegates from “Canada” (that is, Ontario and Quebec) took over another meeting planned to discuss the confederation of the Atlantic provinces. After achieving some level of agreement, delegates from the five British colonies in eastern North America convened in Quebec City in October 1865 to propose the specific details of a constitutional arrangement that would bring all the British North American colonies together. After three weeks, the delegates had hammered out a series of resolutions to take back to their legislatures. These were practical propositions. As Christopher Moore points out, “There is no poetry in the Quebec resolutions.”  Nonetheless, the Quebec meeting later inspired one of the iconic images of the Confederation process, the Robert Harris painting The Fathers of Confederation, which Ged Martin explores in detail in this collection. From the Quebec meeting, the propositions were then debated, with no room for further modifications, in the legislature of the United Canadas. (The United Canadas comprised Canada East or southern Quebec, and Canada West or southern Ontario. The older terms Lower and Upper Canada remained in use.) The government of the day clearly, and not surprisingly, saw this debate as being worthy of a permanent record, and it supported the publication of those debates a short while afterward. Lasting from February 3 to March 13, 1865, and totalling over 1,000 pages in printed form, these debates are available for consultation in print and online. In the 1960s, at a time when the Canadian government was celebrating the Centennial of Confederation, Professor P.B. Waite of Dalhousie University, one of the leading specialists in the politics of the period, edited a condensed version of the debates. In this edition, he appropriately dedicated much attention to capturing the words of the leading figures, John A. Macdonald, attorney general for Canada West (Ontario), George-Étienne Cartier, attorney general for Canada East (Quebec), George Brown, leader of the Grit Party (a forerunner to the Liberal Party), Thomas D’Arcy McGee (Conservative politician and one of the most compelling speakers), and the (essentially titular) premier Étienne-Paschal Taché, a life member of the Legislative Council, which had a function similar to today’s Senate. He also conveyed the opinions of some of the key opposition speakers such as Christopher Dunkin and Antoine-Aimé Dorion, for instance. Many other members of the Legislative Assembly and Council contributed to the debates. We asked the contributors to this collection of essays to read the Waite edition as a starting point, and some of them have chosen to privilege the longer edition of the debates. We believe that readers may benefit from reading the Waite edition, still accessible today in a second edition with a new foreword by Ged Martin. Janet Ajzenstat and her colleagues have provided a more comprehensive edition of the debates in the Canadas and elsewhere in British North America in their book Canada’s Founding Debates. This collection of essays shows the variety of readings that the same document may inspire, depending upon one’s focus and interests. The group of scholars assembled here, largely from York University, but also including scholars from other universities, chose a wide variety of topics. Some selected issues that were central to the discussions (the Atlantic colonies, definitions of democracy, religious minorities, French Canadians, and taxation). Others examined issues that were important in the context of the period and some of which would become central to subsequent understandings of the country, but which the politicians of the day may have discussed only obliquely (agrarianism, the environment, labour, Indigenous peoples, historical consciousness, rights, and gender). We have attempted to read the document both for what the politicians expressed and for what they did not feel the need to express. We have also tried to examine the debates in a longer time frame—the starting point of the project was to ask contributors the following question: “From the vantage point of 2016, how can we read the Confederation debates in 1865 in the Canadian legislature from the perspective of the chosen topic?” The reader will readily see that many divergent readings of the same document are possible. Colin M. Coates teaches Canadian studies at Glendon College and is the former director of the Robarts Centre for Canadian Studies. Philip Girard is professor of law at Osgoode Hall Law School, York University. We would like to acknowledge the Robarts Centre for Canadian Studies and the Vice-President for Research and Innovation at York University for their support for this project, and of course all the contributors. Laura Taman, coordinator of the Centre, has overseen the publication process. We hope that this publication will help readers understand better the context of the central Canadian debate over the terms of Confederation and to reflect on the successes and the failures of the politicians who agreed to the constitutional arrangement of 1867. Christopher Moore, 1867: How the Fathers Made a Deal (Toronto: McClelland & Stewart, 1997), 129. P.B. Waite, ed., The Confederation Debates in the Province of Canada, 1865, 2nd ed. (Montreal: McGill-Queen’s University Press, 2006). Note that all page references to this version of the debates in subsequent essays are indicated in brackets within the text. Janet Ajzenstat et al., eds., Canada’s Founding Debates (Toronto: University of Toronto Press, 2003).